You will lose marks if you make grammatical errors in your writing, particularly when errors are frequent and effect meaning. Be careful of the following common mistakes when describing numbers. amount and number: amount is used with uncountable nouns; number is used with countable nouns, e.g. The amount of meat consumed in China between 1985 and 2010. NOT number of meat. per cent and percentage: per cent is always used with a number; percentage is used on its own without a number, e.g. The percentage of male teachers in the UK. NOT the per cent of male teachers. According to the graph, four per cent of the total household budget went towards transportation. NOT four percentage. 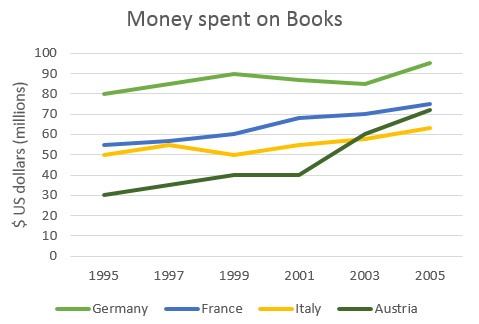 The graph below shows the amount of money spent on books in Germany, France, Italy and Austria between 1995 and 2005. Read the following sample answer. Complete the answer by filling the gaps with the words in the box. The line graph compares the amount of money spent on buying books in Germany, France, Italy and Austria over a period of ten years between 1995 and 2005. In 1995 Austria spent the ........... amount of money on books, while Italy and France spent about as ........... as each other. However, by 2001, the gap in spending between these two countries had widened and considerably ........... money was spent in France than In Italy. As can be seen from the graph, the amount of money spent increased in all four countries but rose the most ........... in Austria. The period between 2000 and 2005 saw a ........... growth and in 2005 the Austrians spent ........... as much money as they did in 1995. However, during this ten-year period, Germany remained the ........... spenders on book, with all three other countries spending much ........... on them.